Since 2014 Ida Möller and Renate U. Schürmeyer make the following questions a subject of discussion within their project: What is nice? What is not nice? 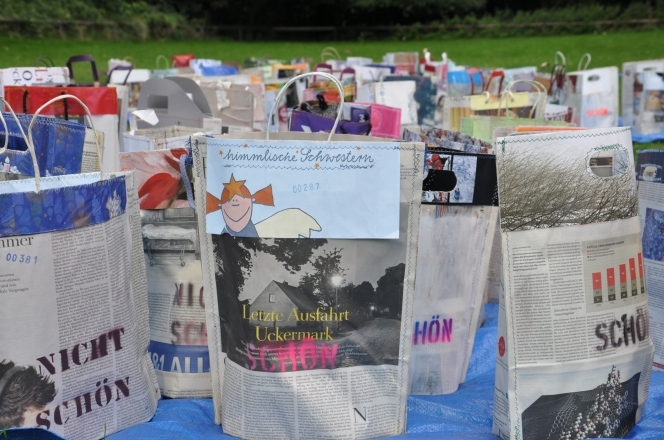 With their SCHÖN _NICHTSCHÖN_Tüten (artbags), which are sewed from newspaper and other leftover materials, the Artists arouse curiosity and interest among visitors. Newspaper reports, headlines, pictures and illustrated reportages, which already have been read or seen suddenly appear on the artbags in a different context than before. What do we see differently or appears to us in a new light? What is it we transport through words and pictures? What touches us emotionally, brings back memories, connects with own experiences and provokes discussion? Do they trigger thoughts about the nice and not nice, do they promote conservations about the production processes especially about textile production in low-wage countries, about an intrinsic value? Topics on recycling and conscious use of resources are stimulated. Over 500 SCHÖN_ NICHTSCHÖN_Tüten (artbags) have been sewed from old newspapers and leftover materials and marked as SCHÖN (nice) and NICHTSCHÖN (not nice). Every single artbag is numbered, photographed and archived. The project is designed as a continuous process. The exhibition ZNE is the 9th exhibition venue. Ida Möller (*1960) lives in Lübeck, Germany. Renate U. Schürmeyer (*1957) lives in Bernstorf/Jeese, Germany.